Dubai plans to roll out the first driverless taxi drone this summer. Flying taxis and other futuristic passenger vehicles are about to take a giant leap out of science fiction and into reality. It’s not exactly the vision of the “Back To The Future” film trilogy, which predicted that by 2015 we’d fill the skies with flying cars and get around on personal anti-gravity hoverboards. But it turns out the movies may have just been a few years off. 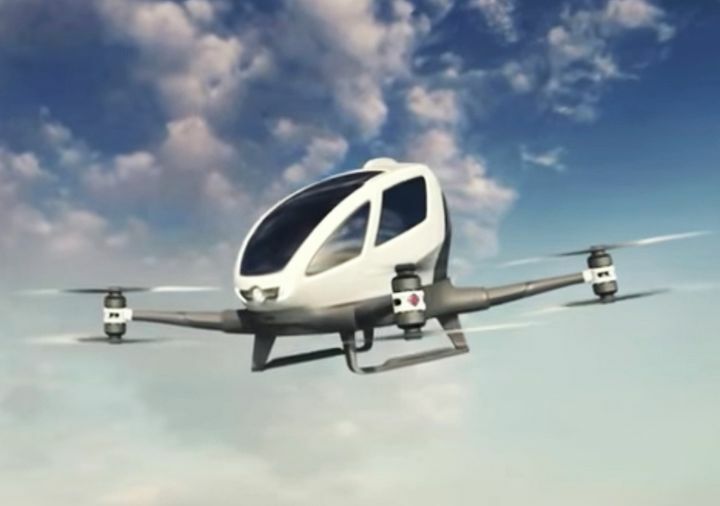 Singapore plans to have airborne cabs taking flight by 2030, according to the island city-state’s Business Times daily newspaper. Singapore’s Ministry of Transport Permanent Secretary Pang Kin Keong said he’s in talks with tech companies to begin trials to create drones to carry passengers. Three companies on tap to manufacture the drones include a Russian-made Hoversurf Scorpion, the German Volocopter VC and China’s autonomous aerial device Ehang 184, pictured at the top of this story and in the video below. The electric-powered Ehang 184, with its four arms with eight mounted propellers and weighing 440 pounds, can transport a person for about 23 minutes ― covering a distance of 10 miles at a maximum height of just over 11,000 feet. The passenger would merely punch in a location on a control pad and Ehang 184 does the rest. Single-person taxi drones aren’t the only ultra modern transportation mode on Singapore’s drawing board. They’re also looking to create driverless buses that carry multiple passengers. Pang revealed both of these concepts at the Business Times Leaders’ Forum this week. “There is going to be a significant shift in the public mindset from one of ownership of transport assets ― which is the mindset today ― to one of procurement of transport services as and when you need them,” Pang told the 400 forum attendees. But you won’t have to wait until 2030 for Singapore’s launch of the Ehang 184. Dubai is preparing to roll out that high tech drone this summer, according to Fortune.com. Dabitk/Technology News / YouTube After many test flights of the Ehang 184 driverless drone taxi, it is scheduled to be introduced in Dubai this July. And with news that Uber has hired a NASA engineer to develop airborne cars, it’s surely only a matter of time before you too can hitch a ride in a flying cab.